Combining tabletop roleplay, deckbuilding, and Arkham-style combat, Hand of Fate 2 brings together a hearty mix of decision making and short fight scenes in a cohesive, exciting adventure. 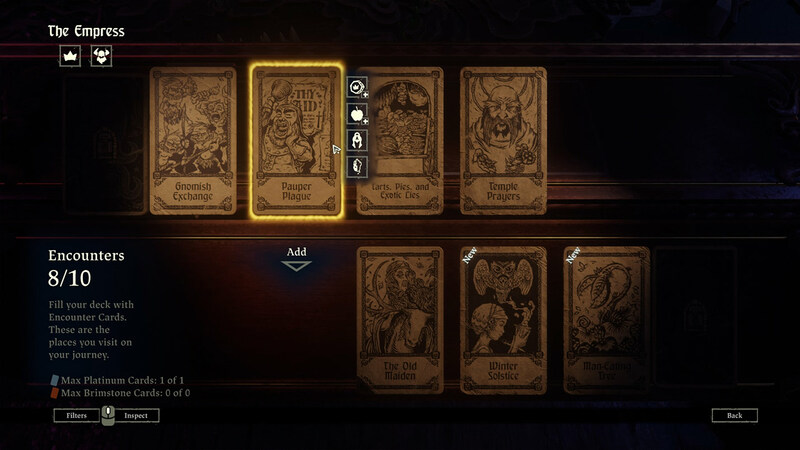 If you’ve played the first Hand of Fate, you’ll know what to expect — the interesting subtleties of planning encounters in a deck and how to best approach various tasks remain, but the sequel helps bring everything together much more smoothly, with combat in particular feeling much more enjoyable: enemy attacks are better telegraphed, while animation and general flow of combat has had a serious polish. 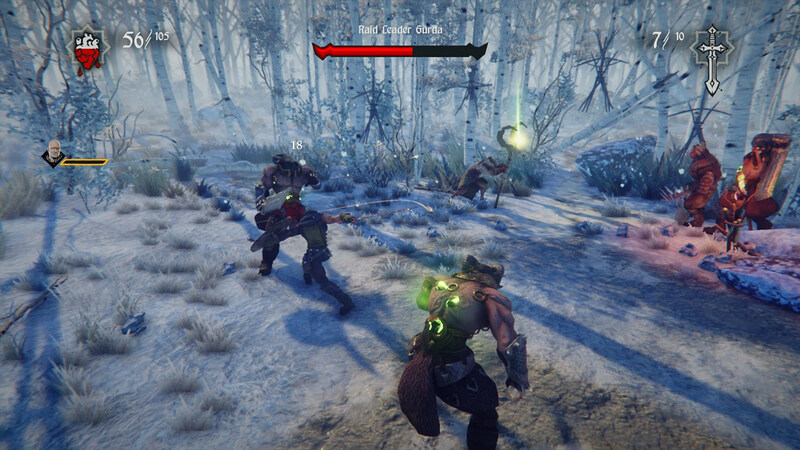 Hand of Fate 2 revolves around a series of quests, which are standard roleplay fare, whether it’s seeking out and killing a powerful enemy or tracking down a magical artifact or blessing. Quests are played out by way of cards laid face down on the table in front of you to journey across as you see fit, each card representing an encounter such as a hostile ambush, a chance at loot, or a new location of interest for later. A deck’s cards are chosen by you before you begin (with a few extra thrown in by the dealer), which lets you pick and choose which encounters you want to run into along your journey. 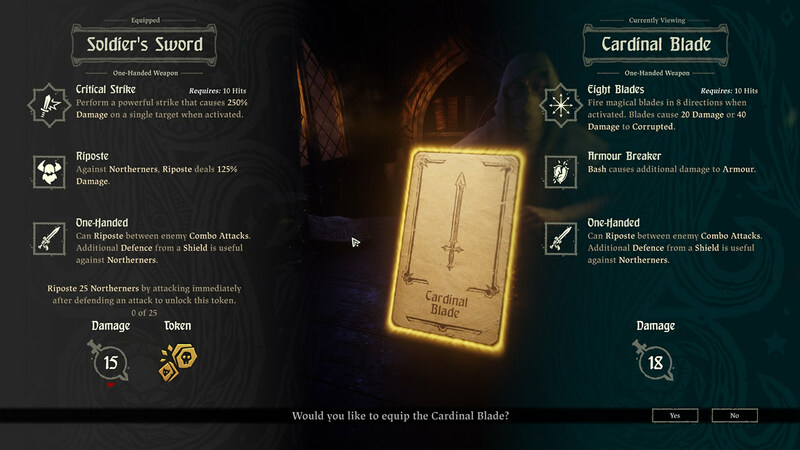 Certain cards have tokens attached, which can be claimed if you successfully beat such encounter; once a quest is completed, all tokens won grant new cards for later selection, including new side missions, items and equipment, or foes to tackle. Planning each quest thus becomes one of the more tactical parts of Hand of Fate 2 as you plan which encounters you’d like on the table, given that there is a hard limit on how many you can include; do you take that card that always grants useful supplies to help you keep going through a tough quest, or risk running a new card to discover what it offers and potentially unlock additional new cards? Much of the gameplay remains at the tabletop, where you’ll be guiding yourself across the board from card to card, making decisions as you discover new people and situations, though occasionally you’ll be pulled into a fight whether by choice or fate. Here the game changes, dropping you into realtime third-person combat where you’ll need to take down your opponents or die trying. Combat is fairly straightforward, with the options of standard slicing strikes as well as heavier attacks to stagger opponents who may be adept at blocking or evading your regular attacks. Enemies on the attack will telegraph their next move, signalling whether or not it’s blockable; blockable attacks can be countered, leading to a slightly Arkham-esque style of fighting as you pummel crowds of enemies, deftly counterattacking and dodging as needed. Once you’re used to the controls, combat flow feels good, and becomes a lot of fun. Combat, while not groundbreaking in any way, remains short enough to avoid monotony, and challenging enough to force you to pay attention, especially with the tricks that bosses can bring to the fight. You won’t be alone in combat, however — across your adventures you’ll run into a roster of unlikely characters who’ll become companions, and you’ll be able to choose one to bring along for aid in any quest. Beyond a small help in combat, companions also serve a bigger purpose of having their own questlines; bringing a particular companion and their current quest cards into a quest reduces the other options you could bring along, but you’ll learn more about their backgrounds and motives, as well as scoring some rather interesting new encounter and loot cards. 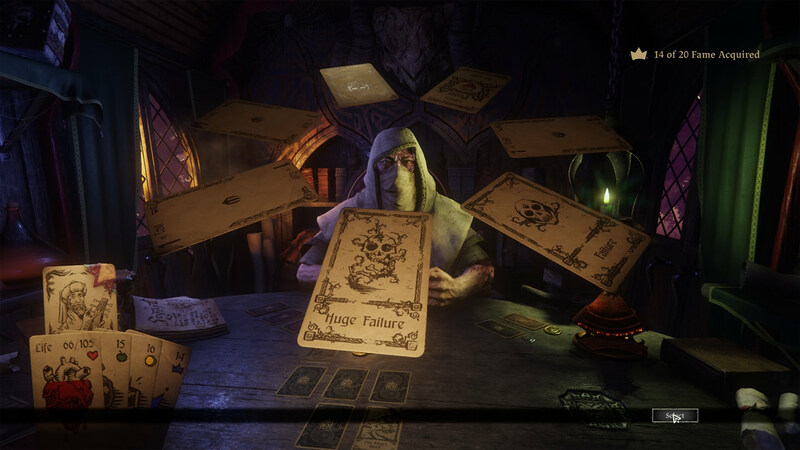 Back at the tabletop, the ominous dealer introduces new tricks in Hand of Fate 2 to keep you on your toes. Attempts at heroics, such as saving villagers from a burning house or swiftly dodging a sprung trap can trigger different types of luck or skill checks. A common one you’ll face is a simple dice roll, where you’ll need to roll three dice and hope to match a particular target; another is the wheel, where spinning cards will require you to stop them on a safe pick — or face punishment. Each quest also tends to favor a particular gimmick or quirk to mix things up; an early quest has you traversing a dangerous, snowy mountain, so the dealer will add a number of freezing blizzard cards to the deck, each rapidly draining your health as you become trapped in them and forcing you to consume more of your ever-dwindling food supplies. These different challenges help bring a little variety to otherwise straightforward gameplay, forcing you to rush through a quest, seek and collect particular objects, or beat the odds to successfully perform enough heroic deeds for fame. Paired with the steady depletion of food as you move from card to card, and the inevitable loss of health from tough combat and failed challenges, and the difficulty can catch you unawares if you’re not paying attention to all the details in front of you. The game never feels overly punishing, however; while difficulty naturally rises over time with the inclusion of tougher opponents and trickier challenges, so too does the availability of powerful gear to trade or loot. Progression throughout Hand of Fate 2 feels fair, and moves along at a decent pace, perhaps slightly faster than the original. 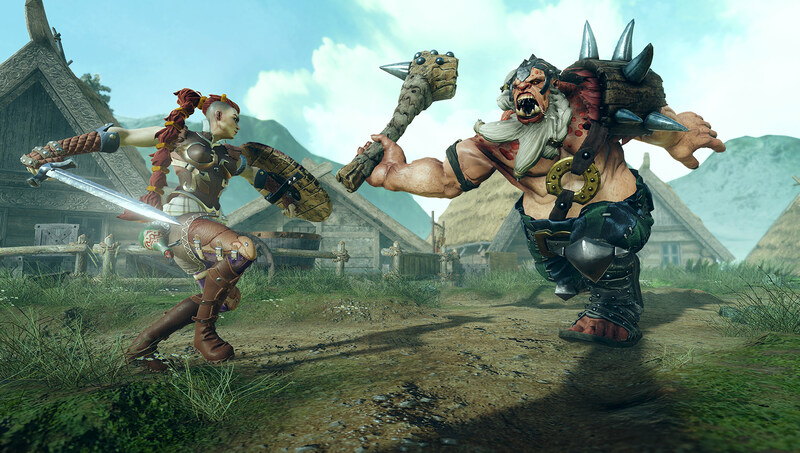 Part tabletop adventure, part third-person combat, Hand of Fate 2 is an unusual amalgamation which successfully manages to let you tailor and experience a multitude of quests. Improving upon the original with more focused direction, customisation and improved combat flow, RPG and "choose your own adventure" fans should certainly take a look.